This months featured site highlights the issues of plastic packaging particularly in the form of carrier bags and disposable cups. Although the site is American the subject is relevant to the U.K and most nations in the developed world. Bringyourown.org has a host of amazing statistics and frightening information relating to plastic pollution but also offers advice for everyone on how to reduce the waste and encourages the principle of reuse. Whilst it’s good to recycle your plastics it’s even better to reduce your plastic consumption altogether. For those of you who go shopping in the car-keep a stock of eco friendly bags in the boot and for those of you who walk or cycle to the shops try a rucksack with a few spares in the pockets. When out food shopping opt for the less packaged items and use paper bags where possible. If you love your coffee shops ask for a cup instead of a plastic container and when commuting take a flask instead. 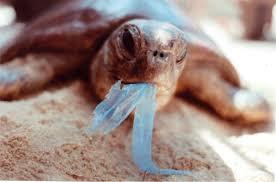 Here are a few facts about the perils of plastic…. The main factor of the 1988 and 1998 floods in Bangladesh were a blocked drainage system caused by discarded plastic bags. Plastic bags are now banned in the capital Dhaka. Thousands of sea turtles and marine mammals, and millions of sea birds and fish die each year from entanglement and ingestion of marine litter, mostly plastic. In China 2 billion plastic bags are used every day and in the U.K we give out 10 billion bags every year. Marks and Spencers have introduced a 5p charge on their food carrier bags and other supermarkets are now under increasing pressure to introduce similar measures.